The turning of the leaves means major closet turnover as well. Gwen and Lindsey are trading summer whites for structured blazers and sundresses for sweaters. 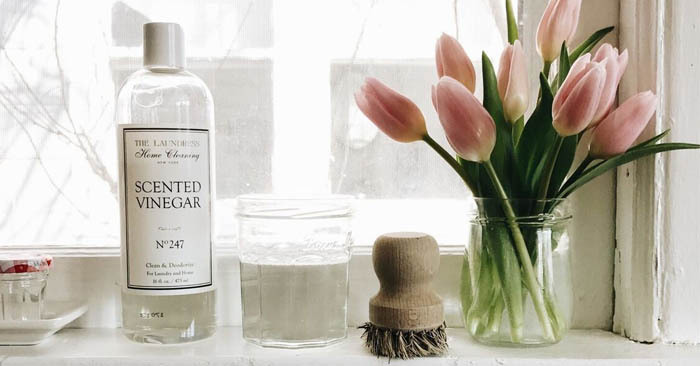 See which pieces these leading Laundresses are falling for this season and how to care for similar pieces you may have in your closet at home! Lindsey is looking forward to bundling up in this relaxed merino wool cardigan with honey-comb patterning. It can be easily dressed up for work or dressed down with a tee and jeans for the weekend. Learn how to care for merino wool at home. This feminine twist on a menswear staple features puff sleeves and a gorgeous blue corduroy fabric that’s perfect to wear all season long. Get our how-to for caring for corduroy. Lindsey loves this voluminous 1940s-inspired print skirt and the beautiful fall hues. She plans to wear it with a chunky knit for a trendy casual vibe or a tailored blouse for a more buttoned up look. This blue polish is a fun and unexpected way to add a bit of edge and pop of color to neutral autumn ensembles. Lindsey is swooning over this gorgeous lilac jacket. The unexpected shade is flattering and can complement anything in your closet. Who says lilac can’t be a neutral? It’s no secret that tuxedo vibes are totally chic. These versatile must-haves can be dressed up or down in a flash. Check out our denim care guide. Lindsey always keeps a scarf on hand. When chilly mornings give way to warmer afternoons, this luxe silk-cashmere blend version is the perfect layering companion. It also makes for a cozy travel wrap. Learn how to launder cashmere at home. Lindsey doesn’t wear a lot of black, but she couldn’t refuse this jersey dress with lace inset blouson sleeves. She’s pretty sure this will be her “uniform” piece this season and it’s black after all. This new blazer was Gwen’s latest impulse buy. During a visit to The Laundress flagship in SoHo, she stopped by Veronica Beard and loved it so much, purchased it on the spot! It’s a flattering cut on everyone and comes in navy and black, so it goes with everything. Follow our how-to for caring for blazers at home. Gwen loves a good designer collaboration and couldn’t resist this twist on a classic midi skirt from English designer J.W. Anderson for Uniqlo. Everyone needs a good pair of tights on cooler New York days. These black tights from Wade & Bell offer a yoga-inspired waistband that are comfortable all day long. Learn how to care for your tights here. These jeans from J.Crew are one of Gwen’s go-tos. The frayed bottoms offer an edgy take on classic skinny jeans. Learn techniques to clean and preserve your denim here. Gwen is always into a good quality shoe. She even had her last pair of black Ralph Lauren boots for 20 years! She’s finally replacing them with this leather pair from J.M. Weston and hoping they will last just as long. Gwen came across this gorgeous 100% wool Gucci dress in a magazine and has been lusting over it ever since. It’s the only black piece in the entire Gucci fall collection. Learn how to care for wool pieces at home. Gwen purchased this 100% lamb’s wool wrap on her last winter visit to London. She can’t wait to add it back to her fall fashion rotation. Follow our guide to washing wool at home. This year is all about Victorian-inspired styles. Gwen loves this button up for its gorgeous details including the stand collar, curved hem, and ruffle. Made of high-quality poplin, the shirt retains its structure. Learn how to launder dress shirts at home.